Momentum Investing: It Works, But Why? Conventional wisdom says that once any stock-picking strategy nears “sure thing” status it should be doomed. If everyone knows the secret to vast riches, how could the strategy possibly work anymore? But there is a successful strategy that has been followed — and widely discussed — for decades, yet somehow persists as a relatively reliable money-maker: “momentum” investing, which is betting that the stock market’s recent winners will remain winners in the near term and, likewise, that the recent losers will remain losers. The strategy also is known as “relative strength” investing. In the academic world, the pioneering research on momentum was a 1993 study published in the Journal of Finance by Narasimhan Jegadeesh and Sheridan Titman, both at UCLA Anderson at the time. They documented how strategies of buying recent stock winners and selling recent losers generated significantly higher near-term returns than the U.S. market overall from 1965 to 1989. The authors established the basic time frame for momentum-investing success as a three-to-12-month window on either side. In other words, a stock’s relative performance over the previous three to 12 months typically predicted its relative performance for the following three to 12 months. They measured various time combinations of prior returns and future returns within those windows and found trading them to be “on average quite profitable” strategies. For example, a portfolio that selected stocks based on their previous six-month returns, and then held them for six months, generated an extra return of about 1 percent per month above what would have been expected. Added up over time, that return premium, compared with the market return, can turn into a rich payoff. But Jegadeesh and Titman didn’t attempt to explain precisely why momentum investing should work so well. And in the ensuing 25 years, the question has defied a definitive answer, says UCLA Anderson’s Avanidhar Subrahmanyam. “We are still no closer to finding a discernible cause for this phenomenon, in spite of the extensive work on the topic,” he says. Subrahmanyam thinks it’s high time to solve the mystery. In a review article published in August 2018 in the Pacific-Basin Finance Journal, he made the case that a deeper understanding of momentum has been hampered because “so many explanations [have been suggested] without any attempt to test for mutual exclusivity of the predictions.” Subrahmanyam surveys the existing work on the topic, seeks to categorize it and then suggests how to narrow future inquiry to find consensus on the explanation behind momentum investing. It isn’t a traditional research paper, but a possible roadmap for its author and others. “I argue that effort should be focused on ruling out alternative explanations for momentum and trying to home in on the ‘true’ explanation(s) rather than allowing the finding [of momentum] to get ‘over-identified’ via multiple stories for the same phenomenon,” he writes. There’s a good reason for academics to want to nail down the key factor behind momentum’s success: As an investment strategy, it’s a thumb in the eye of the “efficient market hypothesis” (EMH), one of the central tenets of modern finance. EMH, developed by the economist Eugene Fama in the 1960s, holds that a stock’s price at any moment reflects all of the relevant information about the company. So it’s impossible to ferret out a bargain because investors are rational beings and share prices are always exactly what they “should” be, given what investors collectively know. That, of course, is the argument that has made index (or “passive”) stock investing so incredibly popular over the last 20 years: You can’t outsmart the market, so just own the whole thing. Study after study has shown that momentum stock investing typically is a market-beating strategy — but also that it isn’t foolproof. So how has that translated into real-world results? Consider the iShares Edge MSCI USA Momentum Factor exchange-traded fund (ticker symbol: MTUM). Launched in 2013, the fund has grown to $10 billion in assets by convincingly outperforming the benchmark Standard & Poor’s 500 index for most of the last five years. The fund is designed to track the MSCI USA Momentum Index, which comprises the recent best-performing U.S. large- and mid-capitalization stocks. The fundamentals of the companies don’t matter; the stocks just have to be market leaders to get into the index (and the fund). To identify the leaders, each of the 675 stocks in the broad MSCI USA market index is given a “momentum value” based on performance over the recent six months and recent 12 months. The momentum values then are risk-adjusted to give each stock a momentum score. The 120 or so highest-scoring stocks then make up the index. Twice a year the index — and the fund — are reconstituted to pick up new market leaders and sell those that have slumped out. Not surprisingly, the current portfolio is dominated by stocks that have led the bull market in recent years. That includes tech titans such as Amazon, Microsoft, Netflix and Intel, credit card processing giants Visa and MasterCard, and aerospace leader Boeing. 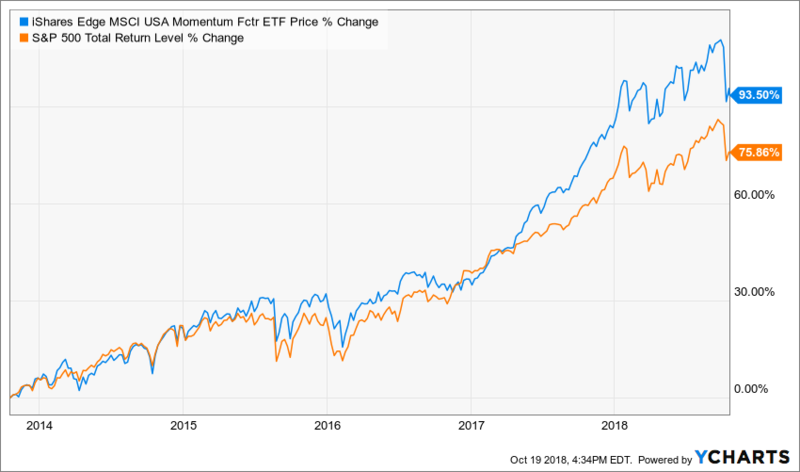 Over the last five years (through October 18, 2018), the iShares Edge MSCI Momentum Factor ETF gained an average of 15.5 percent per year. That trounced the S&P 500 return of about 12 percent per year. But it hasn’t been a straight line for momentum: In calendar year 2016, the fund edged up just 5.0 percent, less than half the S&P’s 12 percent return. And as tech stocks have faltered recently, the fund has struggled: It lost 3.7 percent in the 30 days through October 18, 2018, compared with a 0.8 percent loss for the S&P. If the pullback in the market’s recent leaders continues, or market volatility overall spikes, MTUM and its rivals could temporarily feel the pain. In the market crash year of 2008, the MSCI USA Momentum Index sank 40.9 percent — worse than the 37.1 percent drop of the market overall. And as the market recovered in 2009, the momentum index initially lagged, gaining 17.6 percent compared with the broad market’s 27.1 percent rebound. But because the fund is designed to shift into whichever stocks become the new leaders, it has time on its side if momentum persists as a winning long-term strategy. In an interview, Subrahmanyam said he considers momentum investing to be not just one of the bigger challenges to the efficient market hypothesis, but rather, “I would say it is the biggest. It is, first, trivially simple to exploit and, second, is robust through time” in its market-beating performance. In fact, a 2013 study looked back 215 years and confirmed that the ability to earn premiums from momentum strategies existed not just in U.S. stocks but in foreign markets, bonds, currencies and commodities. Still, the question persists: Why does momentum work? In his research into 25 years of academic literature on momentum, Subrahmanyam found that many of the rationales presented for the strategy’s success fall into one of two behavioral categories: Investors either overreact to important information, or they underreact to it. Because, after all, we’re only human. Grinblatt and Han (2005) propose that a natural investor reluctance to sell losers and an eagerness to sell winners (the “disposition effect”) cause share prices to underreact to true fundamental news. Hong and Stein (1999) suggest that the mechanical trading of momentum players — that is, simply trading in the direction of past price changes — fuels an overreaction to information because the traders often continue with such “directional” bets even after important news is fully incorporated into stock prices. Apart from the behavioral overreaction/underreaction theories, Subrahmanyam notes that some researchers believe that the premiums earned from momentum strategies are merely the logical market payoff for taking greater risk. In other words, if you assume that momentum stocks’ riskiness rises as the stocks climb, there should be a higher reward for accepting higher risk. Subrahmanyam doesn’t favor one theory over another in the hunt for what drives momentum returns. But he suggests fellow researchers’ time would be better spent narrowing down the field of possible explanations before adding new ones. Avanidhar (Subra) Subrahmanyam is an expert in stock market activity and behavioral finance. He is known for his pathbreaking research in the use of psychological principles to explain stock price movements and has published numerous articles in leading peer-reviewed finance and economics journals. Subrahmanyam's current research interests range from the relationship between the trading environment of a firm's stock and the firm's cost of capital to behavioral theories for asset price behavior and empirical determinants of the cross-section of equity returns.